This is the last week of my three week cleanse and I have learned so much about clean eating and eating healthier. My largest takeaway is that I have learned how to spin a recipe so that it is gluten and dairy free while still bursting with flavor. 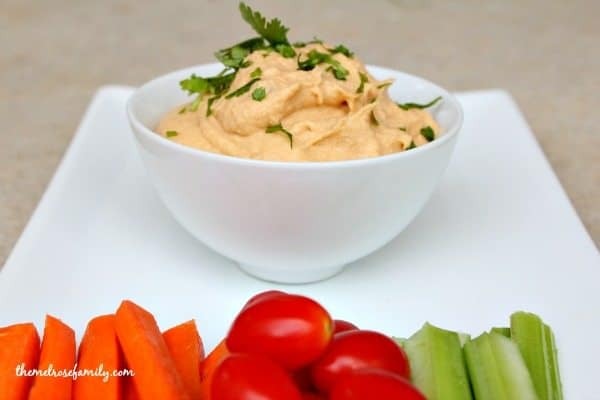 This Chickpea Buffalo Dip is the perfect game day appetizer for Meatless Monday, Monday Night Football. 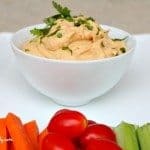 You can easily serve this Chickpea Buffalo Dip with chips, but for those of us eating healthier, fresh veggies does the trick. 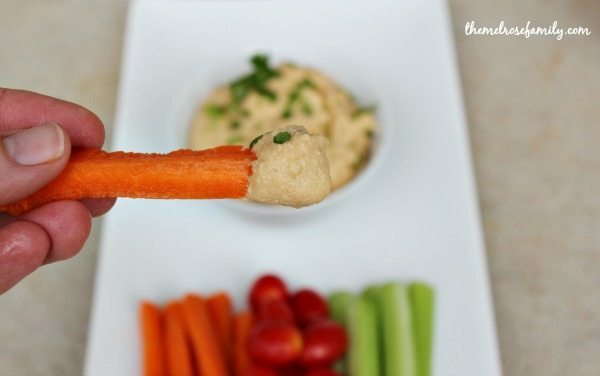 The buffalo flavor combined with the smoothness of the chickpea puree is the perfect combination. I love knowing that it is also dairy free due to the Silk Unsweetened Almondmilk. During my clean eating journey, I’ve found that I’m very particular about the meat that I want to eat, which is great because Silk has a fabulous resource for meatless recipes as well as a giveaway going on right now. 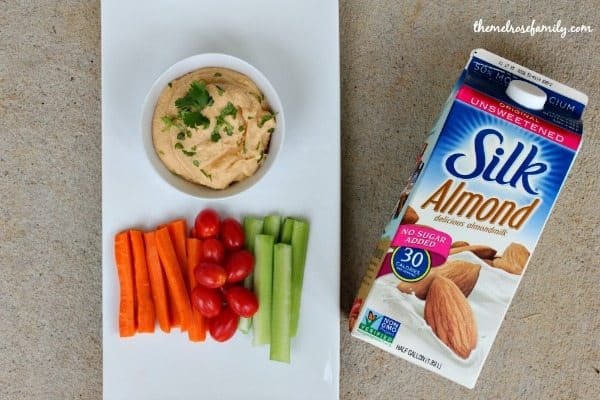 Not only did this dip remind me of the buffalo chicken dip that my sister-in-law is famous for, but I didn’t feel guilty about eating it because I knew that it was made with clean ingredients. I’m telling you that there’s just something about knowing that you’re making choices to keep your body healthy. I know you’re probably rolling your eyes because that’s what I used to do when people would get onto their high horses about “your body is a temple”. The reality is that I feel better. I have more energy throughout the day and my body actually craves the leafy green vegetables when I haven’t had enough during the day. In other words, don’t knock it until you’ve tried it. Plus you can feel good knowing that you don’t have to give up game day appetizers like this Buffalo Dip. I swear I could have eaten it with a spoon and it’s actually amazing on a lettuce wrap with some fresh vegetables like bell peppers, cucumbers and red onion. It makes a great lunch! 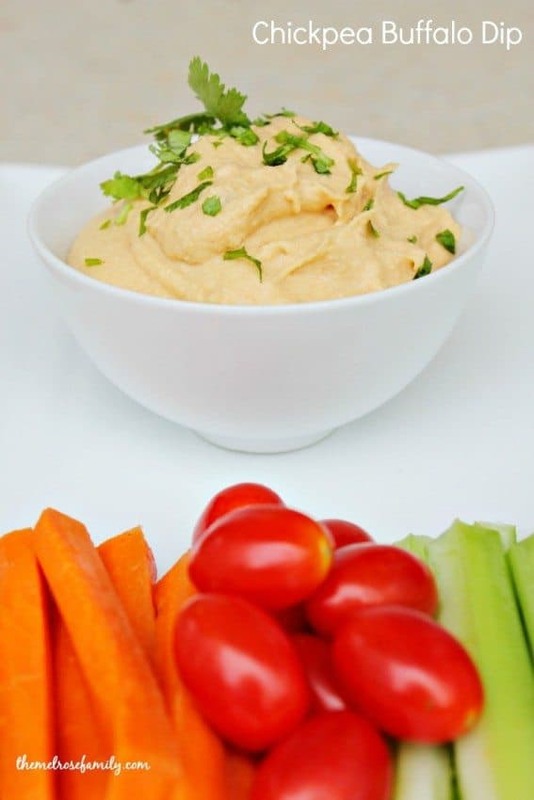 Chickpea Buffalo Dip is gluten and dairy free and makes the perfect game day appetizer. In a food process, puree the chickpeas and cashews. Add in the Almond Milk, garlic and red hot to make a paste. Garnish with fresh chopped cilantro. Serve with fresh vegetables or chips. I’m a vegetarian & I go thorough so many chick peas I should probably buy stock in them lol!! This sounds like a delicious way to make them that I’ve never had! Can’t wait to try it!